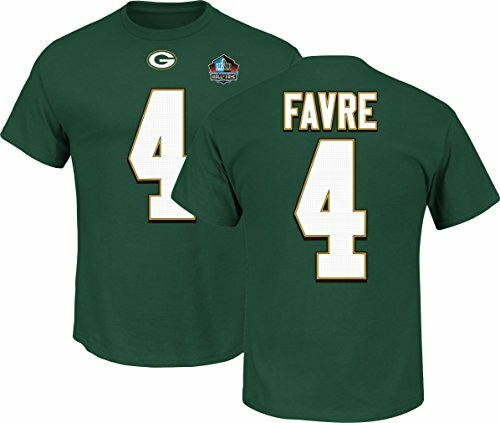 VF Imagewear's Name & Number tee is a great way to show off your favorite player and team! This NFL officially licensed short sleeve T-Shirt is 100% cotton with the player name & number screen printed on the back and player number with team logo on the front. Player number on front, along with name and number on back are screen printed with a technique that gives the print a bit of a raised feel and have a "dotted" look.It looks like a jersey with the cost and comfort of a T-Shirt!Size Chart:Arm pit to arm pit / back of neck to tail of tee*Small - 18.5" / 26"*Medium - 20.5" / 27"*Large - 21.5" / 28"*XL - 23.5" / 29"*2X - 25.5" / 30"Sizing will vary a bit, please use the above as a guide and contact us if you have any questions. Small - 18.5" / 26" Medium - 20.5" / 27" Large - 21.5" / 28" XL - 23.5" / 29" 2X - 25.5" / 30"Sizing will vary a bit, please use the above as a guide and contact us if you have any questions.